1/2" NPT Metal Bowl, 6 oz. 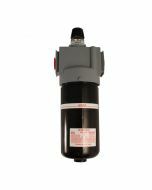 This 1/2" NPT lubricator with metal bowl is the drip style, which allows precise settings for trouble free protection. The adjusting knob can be removed in order to prevent tampering and the sight glass dome allows observation for instant drip rate adjustment. The 6 ounce meal bowl may be filled without shutting down line pressure, delivering oil at an air flow as low as 2 SCFM. 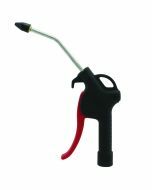 Lubricator is designed to provide oil to air tools that require oil for operation. Maximum pressure of 200 PSI and 142 SCFM.